St. Martin's Griffin, 9780312573768, 304pp. Three years after his divorce, James Keeper is enjoying his new job selling antiques at a quirky shop. His new love, Leah, is intriguing and passionate. Business is steady and Keeper's friends always turn up for Card Night. But one phone call from his former mother-in-law changes it all. Days later, Keeper comes away with a son he never knew he had. Immediately, life takes on a new meaning. 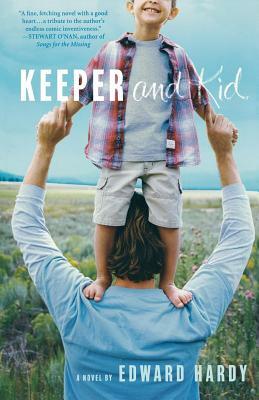 As he and Leo adjust to the shock of each other and their suddenly altered lives, Keeper begins to let in the people in his life—by turns strange and heartwarming; funny and painful. A coming of age story for the guy who thought he had already grown up, this novel is a sharp and witty account of what we do for love. "At once immensely engaging and about the things that matter most: how we love, how we move on, how the past moves with us. Lovely, wise, and surprising." Edward Hardy is the author of the novel Geyser Life, grew up in Ithaca, has an MFA from Cornell, and has published stories with Ploughshares, GQ, Witness, the Quarterly, the Massachusetts Review, and other literary magazines. His work has been included in The Best American Short Stories, and he lives in Rhode Island.